The Sagvoll (11,000 ha) exploration project in Norway is a mature exploration asset that has both seen a variety of resource development and small scale mining. The Sagvoll Licence area represents a “walk-up” drill targets on historical mines with high grade outcrops of multi-metre massive sulphide lenses that have been sporadically developed by small adits, stopes and drifts. Magmatic sulfide-type nickel-copper-cobalt mineralization is also present on portions of the Sagvoll project in Norway. The Sagvoll project, hosts the old Malsa and Gaulstad small scale mines which were in limited production between the years 1865-1891as well as some small scale mining at Akervoll between 1893-1908. The Sagvoll Licence area also contains high grade outcrops of massive sulphide lenses over serval kilometers. Zinc rich mineralization was present during the historic mining, but was not the focus of historic mining recovery activities as production techniques were not able to easily extract the zinc or find many uses for zinc and therefore many bodies of zinc rich and copper bearing mineralization remain. The Sagvoll project also contains the historic Skjardalen nickel-copper-cobalt mine that operated between 1876-1891. 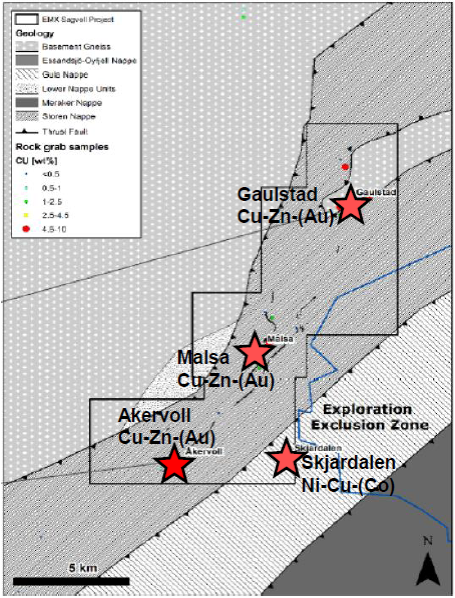 Norra plans to investigate Sagvoll for both the VMS Zn-Cu and Ni-Cu-Co potential.